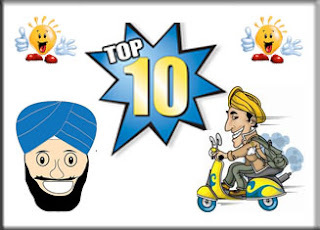 In the previous post we published Top 10 clean jokes & this time we are posting Top 10 very funny sardarji jokes,sms jokes, short jokes, hilarious jokes, Santa banta jokes, amazing jokes, funny jokes in English that will make you laugh through out the day. Share these sardar 2013 -2014 latest funny jokes with your friends and let them laugh for the entire day. All these are free to copy and send by SMS or mail. Just click above to mail or share on Facebook. Sardar: Oye ullu ke pathe _ _ _ EVERY YEAR. Manager asked to sardar at an interview. Can you spell a word that has more than 100 letters in it? After returning back from a foreign trip, sardar asked his wife. Do I look like a foreigner? Sardar: In London a lady asked me "Are you a foreigner?" One tourist from U.S.A. asked to Sardar: Any great man born in this village??? So Sardar writes, "Gandhi was a great man, but I don't know who is Jayanthi. When sardar was traveling with his wife in an auto, the driver adjusted mirror. Sardar shouted, "You are trying to see my wife? Sit back. I will drive. Interviewer: just imagine you’re in 3rd floor, it caught fire and how will you escape? Sardar: it’s simple. I will stop my imagination!!! Banta- When he grows up, I shall ask him what he meant by this.. Conductor: What if you lose both?